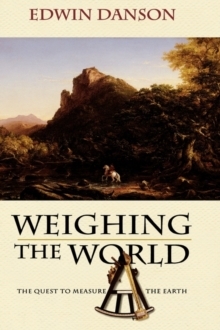 Weighing the World is a revealing behind-the-scenes look at the scientific events leading to modern map making, written by one of the world's master surveyors. Edwin Danson, using a similar approach to his earlier best seller, "Drawing the Line: How Mason and Dixon Surveyed the Most Important Border in America" (Wiley, 2000) takes us on a journey telling the story of this experiment that has not been written about in over two hundred years. National jealousies, commercial and political rivalry were the underlying causes for many of the eighteenth century's wars but war also provided the stimulus for much commercial effort and scientific innovation. Armies equipped with the latest weaponry marched about the countryside, led by generals with only the vaguest of maps at their disposal. At the start of the century there were no maps, anywhere in the world. While there were plenty of atlases and sketch maps of countries, regions and districts, with few exceptions they were imperfect renditions in nature. No one knew, with any certainty the shape of the earth or what lay beneath its surface. Was it hollow or was it solid? Were the Andes the highest mountain on the Earth or was it the peak of Tenerife? Was the Earth a perfect sphere or was it slightly squashed as Sir Isaac Newton prophesized? Just how did you accurately measure the planet? The answers to these and other questions about the nature of the Earth, answers we now take for granted, were complete mysteries. Danson presents the stories of the scientists and scholars that had to scale the Andes, cut through tropical forests and how they handled the hardships they faced in the attempt to revolutionize our understanding of the planet.